The First Mass Transit Super Bowl! NJ Transit, the MTA, and other agencies are geared up for the “first mass transit Super Bowl” (see NJ Transit’s link here). Here’s wishing them (and all the fans) a safe and successful weekend. Everyone has (apparently) lucked out on the weather (although watching some snow – at least on television – would have been fun. Transit map geeks (including me) also have a new map for our collections. 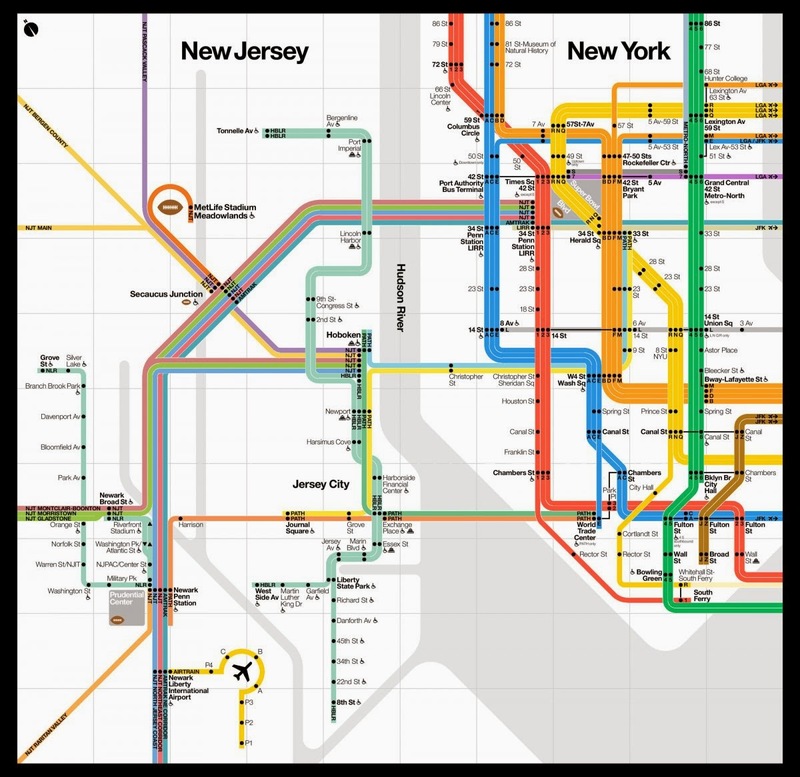 It looks basically like a New York subway map that has shifted focus to the left. Neat. It was good to see the President on his game and taking the initiative, which I think is good for everyone. He appears to have gotten through a rough patch caused by SNAFUs in implementing the Affordable Care Act, which were amplified by a furious and implacable opposition party and a press that has gone negative. Transportation got at least a mention in the speech, though not prominent attention. The President said we “need Congress” to undertake “finishing” a transportation bill “this summer.” He even went so far as to suggest a revenue source for “rebuilding our roads, upgrading our ports, unclogging our commutes.” Unfortunately, that proposed revenue source is money saved from proposed tax reform. Seeing any money from that source, let alone seeing it sent to transportation, seems to be a long shot at best. Even if it were to happen, it would move us farther away from a self-funded transportation trust fund and closer to an annual competition for general revenues with unemployment benefits, food stamps, education, etc. Of more immediate concern, do the President’s remarks mean that transportation reauthorization will be on the agenda for the “breakthrough year” he is urging? Will the Administration be fully engaged, even on the revenue question? It’s possible, and we can hope, but the signs so far have been mixed at best. · “Climate change is a fact” – that’s right. “The debate is settled” – maybe among scientists and rational people. · Prominence given to natural gas, which is controversial and problematic in many ways, nothing about electric power, which is on the streets today and could be scaled up more easily. Not sure why. · Climate change could have been (and still could be) the lead-in to discussion of a transformative new surface transportation authorization bill. This should happen. · I know it’s too much to hope for, but in a better world we would have heard about the power of transportation investment as a stimulus (yes, the “s” word) to reinvigorate our still-too-sluggish economy – and a reminder that it can do so in a balanced, noninflationary way through ramping up a gas tax increase (yes, the “gt” words) in pace with economic recovery. Tesla’s developing network of Superchargers – their proprietary, free, fast charging stations – now features its first Coast-to-Coast route! Tesla owners can now get quick recharges at convenient stopping points (rest areas, restaurants, etc.) that will enable them to travel from New York to LA (as well as up and down both coasts) with minimal inconvenience (story here). Tesla announced their national network less than a years ago (my story here), so they appear to be on track to cover 80 percent of the US in 2014. Supercharger stations are already evolving from minimal parking-space-and-connector locations (like the Milford CT site shown below, one of the earliest) to incorporate solar power canopies and (soon) even faster chargers. Once again, Tesla is breaking the trail, and we can only hope that the “Tesla effect” will inspire other private-sector actors – as well as public agencies – to pick up the pace. Congrats to New York on Posting “Text Stop” Signs! I was very pleased to see New York DOT’s “text stop” signs on a recent trip. It’s no secret to safety people – as well as anyone who pays attention to the news – that texting while driving is a recipe for tragedy. It’s the worst possible type of distracted driving and has caused far too much needless death and injury. 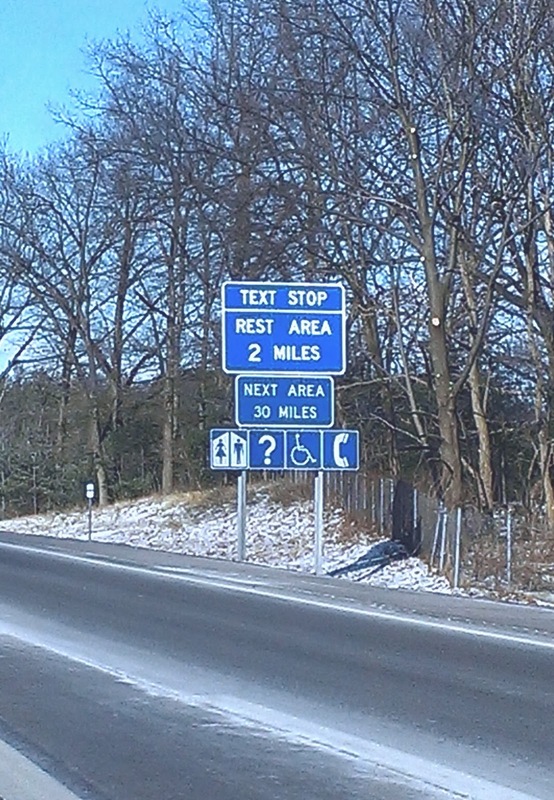 New York’s signs are basically a labeling device (as noted in this story) that remind drivers that they can use any old rest area for stopping and texting safely, and inform them that one of these “text stops” is a short drive ahead. One can only hope that this type of educational device will have an effect. I’m not sure how one can measure success of this signage program, but it’s certainly worth a try. 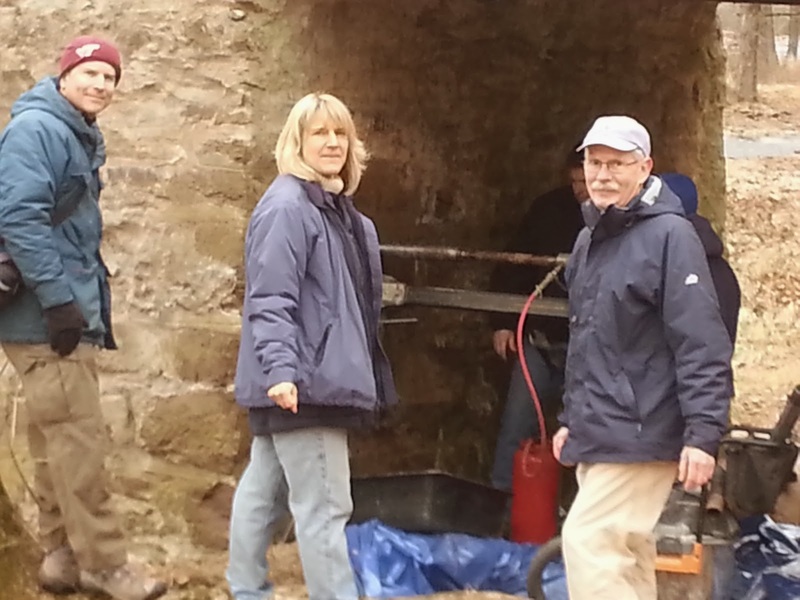 Historic bridges need lots of TLC. Like old houses or vintage cars, they need special care but bring special joy to their owners. Historic bridges, which are owned not by individuals but by communities, can trigger deep emotional responses in those communities, evoking ties to their history and sense of place. All of this makes for challenging work for transportation engineers and planners, who need to find solutions that will keep these structures useful in a 21st century transportation system. A lot of credit should go to advocacy groups, who often take the lead in saving these bridges from indiscriminant destruction. 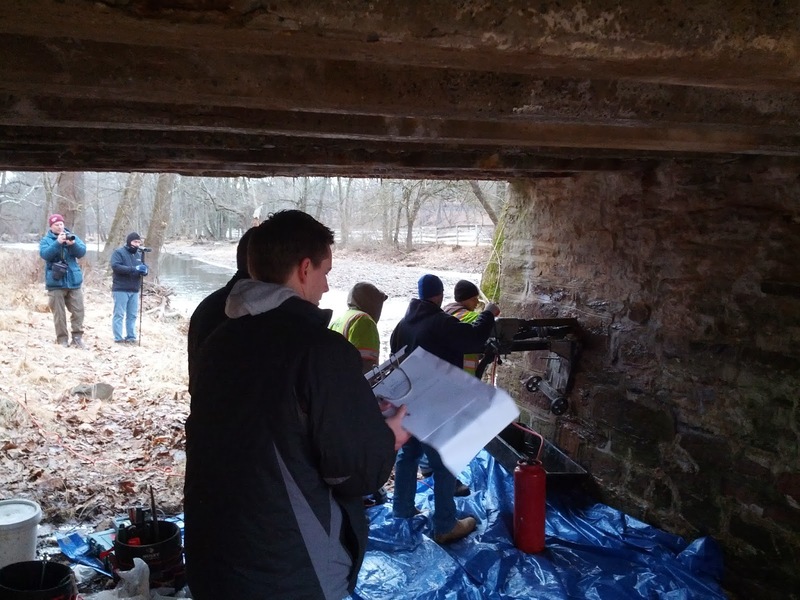 In the case of the Headquarters Road Bridge (also known as the Sheephole Road Bridge) in Upper Bucks County, PA, credit goes to the Delaware Riverkeeper, leading the way toward finding a way to put this 200-year-old beauty back in service. Media giant Comcast has announced plans to build a new 59-story, Norman Foster—designed skyscraper in center city Philadelphia. This is great news for Philly, urban planners, and architectural fans. Transportation notes: Yes, connection to Suburban Station is great, but the quality of some of those underground “concourses” could use some significant upgrading! Also, the connection to regional rail is very good, but the Philly subway system still misses the mark. The city’s two subway lines cross at City Hall, but there is no unified City Hall station! Instead, there are more pedestrian tunnels connecting separate stations on the two lines. And there is no Market-Frankford station between 15th Street and 30th Street, omitting service to one of the busiest areas of center city, including the new Comcast tower, which will be sited between 18th and 19th streets. But the real pressing question: what should the nickname be for the new building? As the YiP story points out, Foster was the architect of the “Gherkin” in London, so the Philadelphia building should get a good nickname too. (Of course London also has the “Shard” and the “Walkie-Talkie.”) Unfortunately the name “Flashdrive” – which I like – is already taken by the original Comcast building next door. Ray LaHood has recently advocated a 10-cent bump in the federal motor fuels tax (story here). First reaction: Of course, blindingly obvious to most of us in the field. Second reaction: Send the announcement back five years in time, when it could have done some good. Could a significant transportation Reauthorization bill, with real revenue, have been passed in 2009 or 2010? We will never know. The team was in place at USDOT: LaHood with his forceful personality and Capitol Hill savvy, backed by John Porcari and Polly Trottenberg and other “A” players. Chairman Jim Oberstar said he could get 40 Republican votes in the House. The economy – and especially the construction industry – desperately needed help. Today the “A” team is gone, Oberstar and his majority are gone, and the number of Republicans who would vote for the gas tax is approximately zero. And the prevailing culture seems to accept that we are poor nation, unable to stop our slow decline. Imagine, if you will, where we would be now if a 10-cent program had been enacted four or five years ago. The nation’s infrastructure would be on its way to a state of good repair. The continued stimulus would have caused a faster economic rebound. The federal budget would be in better shape, due both to increased revenue and economic growth. Thousands of engineers and planners and other transportation professionals, rather than being laid off or underemployed, would be vigorously designing and building and learning. The innovation of the Stimulus program would have continued its momentum, with exciting new 21st century projects. Without a flux capacitor at hand we will have to deal with the present as we have it. Thanks to Ray LaHood for speaking plainly. We still have a future to make. Rhubarb Batteries for the Future! Well, not exactly rhubarb batteries, but something pretty close. Observers of battery technology – which is absolutely critical for electrification of the transportation system – tend to be divided into optimists and pessimists. I think it’s hard not be an optimist if you follow science and engineering news at all. One of the latest developments, from a group of scientists and engineers at Harvard, working in conjunction with Sustainable Innovations of Glastonbury CT, is an experimental “organic mega flow” battery, which stores electrical energy in a sort of soup of organic chemicals, in this case based on organic molecules similar to those found in rhubarb! (story here) This type of battery, according to the study group, could provide a safe, economically viable solution to the problem of storing energy from renewable sources such as wind and solar. Imagine a tank of rhubarb soup next to (or instead of) your tank of home heating oil that stores all the energy you can collect from the solar panels on your roof, heating and lighting your home while charging up your electric vehicle. Future energy solutions could be surprisingly simple in application! I was delighted to hear that New York’s new mayor, Bill DeBlasio, has picked Polly Trottenberg to be his new transportation commissioner. Many of us were sorry to see the transitioning out of Janette Sadik-Khan, who has been a genuinely transformational figure. She has not only changed how New York and New Yorkers think about transportation, she has had a positive effect on cities and states throughout the nation. Many folks were also apprehensive about whom Mayor DeBlasio might pick as her successor at NYCDOT, since he had provided few clues as to either transportation policy or personnel during the election campaign. Fortunately, he, we, and the city of New York could not have done better! Polly Trottenberg is an “A” player, just off a tour of duty as Assistant Secretary for Policy at USDOT. She has been a tireless advocate for infrastructure investment and transportation reform, with a broad and deep background in both. Congratulations to Polly Trottenberg and New York! It’s the start of a new year, and being a (careful) optimist about the future, I can’t resist offering a thought…….